When you experience symptoms of dry eye, or after eye surgery or an eye injury your doctor may recommend using eye drops (artificial tears) or an eye ointment. Why has your doctor recommended using OCUNOX®? Is preservative and phosphate free and is usually well tolerated. OCUNOX® improves the tear film and protects the surface of the eye. Due to its particularly smooth texture, OCUNOX® gently moisturizes your eyes, stabilizes the tear film and prevents tears from evaporating while you sleep. 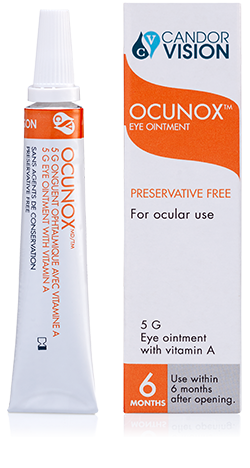 OCUNOX® contains Vitamin A, a natural component of the tear film, that supports tolerance and helps ensure that the ointment mixes well with available tears to relieve the burning sensation of dry or tired eyes. How often and how long can you use OCUNOX®? Usually apply once a day before bedtime. If you feel the need to use OCUNOX® more often, talk to your doctor. The duration of treatment is not limited. Only use OCUNOX® if the sealing ring of the tube is intact. Eye ointments should be used by avoiding any contact between the tube-tip and the eye or the skin. When should I not use OCUNOX®? OCUNOX® should not be used if you are sensitive to any of the ingredients. OCUNOX® is preservative and phosphate free and is usually well tolerated. Why is preservative-free and phosphate free important? Preservatives can damage the cells of the eye surface, destroy the natural tear film and cause intolerance. Phosphates can form practically insoluble crystals due to the reaction with calcium (which is released from damaged cells of the eye surface) and can impair your vision. Modern eye drops and ointments used for dry eyes, particularly after eye surgery or injuries, should not contain phosphates. Because they stay long on the surface of the eye, it is particularly important that ointment-like eye preparations do not contain any harmful substances. OCUNOX® eye ointment is entirely free of preservatives and phosphates. Nonetheless, due to its unique formulation, OCUNOX® eye ointment can be used for up to 6 months after first opening.